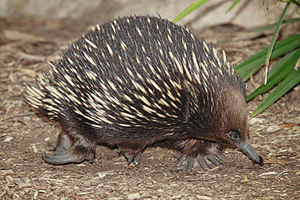 Monotremes are egg-laying mammals indigenous to Australia and New Guinea. The name refers to the “single opening” they have (the cloaca) through which excretory and reproductive functions occur. 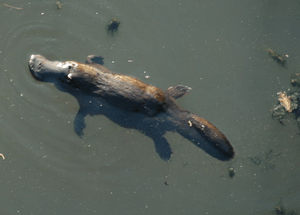 There are two families, Ornithorhynchidae (“bird nose” ; platypus) and Tachyglossidae (“rapid tongue” ; 4 species of echidna). Though they lay eggs, they do produce milk for their young. No defined teats means the milk simply oozes from their mammary glands. They have low reproduction rates (eggs are retained in the mother’s pouch for some time) and lengthy parental care. Lower metabolic rate means monotremes have relatively lower body temperature than placental mammals. As with reptiles and marsupials, they lack a corpus callosum (to be discussed in a later post). They have no teeth in adulthood, but need an egg tooth to hatch. Baby echidnas are commonly referred to as “puggles”.